3 bedrooms, loft, 3 full bathrooms, sleeps 8 comfortably. Welcome to Log Cabin on Big Creek. You and your family will be very comfortable in our creek-side mountain log cabin located in beautiful Highlands, North Carolina. Our cabin is very unique because it sits right next to a very large creek. From both back porches you look right down into the water. We have high-speed internet with WiFi and BlueRay DVD. You will enjoy our secluded location off a private gravel road. The only sounds you'll hear while sitting in our large screened-in porch are the rushing of water from the creek, wind in the trees, and if you're lucky, a trout reaching for a mayfly. The cabin sits at an altitude of over 3,800 ft. so the temperature is at least 10 degrees cooler than Atlanta and there is relatively little humidity! There are wonderful hikes throughout the Highlands/Cashiers area to be enjoyed year round. After your hike you’ll enjoy a soak in our jetted tub. If you're looking for a pet-friendly vacation, you've come to the right spot. We consider all pets except cats. No Smoking: We have a strict no smoking policy in the cabin. If you smoke outside the cabin please field strip cigarettes and throw the butts in the garbage. We are very good about keeping the availability calendar up to date. Pets: We accept dogs that don't tear-up the house and landscaping, however, there is an additional $50.00 charge, per dog, per stay, for interior clean-up and a $100 refundable deposit. Please do your best to pick-up after your dog outside. Please don't leave your dogs in the cabin unattended for long periods of time. Cats are not allowed under any circumstances as the owner is very allergic! Other pets are okay with prior approval. Finally, although our cabin is pet friendly we are not flea friendly! In consideration of all our renters, please make sure your dogs are free of fleas or you will be charged to get rid of them. Seasons: There is a lot to do all year round in the Highlands/Cashiers area. Off season can be the best time if you like the many hiking trails all to yourself. Leaf Season is spectacular. We often get snow in the winter to be prepared with a 4-wheel drive or chains. Creek-side setting on a private road. Cabin sits next to Big Creek. In new addition only. There is not air conditioning in the older part of the cabin. Located in the new addition. The kitchen is small but well equipped and you will find all the basic appliances including a mixer. There are enough place settings for at least eight in the large dining area. Summer seating for 10 on the screened-in porch. Additional dining table inside cabin with seating for 8. 55" TV in addition and 20" TV in main cabin with Blueray. We do not receive a broadcast or cable signal. All content must be streamed through WiFi. Both canoe and Kayak. Life jackets for kids and adults. Screen-in porch facing creek with seating, dining table and dart board. Lower porch facing creek with seating for 5. Additional porch in front with two rocking chairs. Located between the two buildings facing the creek. Beautiful location in the Highlands! The creek beside the cabin is heavenly! This cabin was a perfect distance from the town of Highlands - just enough outside of town, and just close enough. The VERY woodsy setting was beautiful and the creek right beside the cabin is serene to listen to while sitting on the large screened-in porch. I bet the summertime stay would be even more amazing! We appreciated the cut, dry firewood for the two fireplaces and the two living spaces so we could spread out (we had 6 teenagers with us!). The kitchen is a bit small - no more than two people can fit to cook or clean and the pans left a bit to be desired, but that is only if you are cooking in the cabin (which we did a lot of). The entry to the cabin is dicey if you have anyone who isn't steady on their feet - the large stone steps are beautiful, but very slippery and not uniform....carrying luggage/supplies can be a little challenging. The addition to the cabin was spacious and well-done...large shower/bathroom with a regular-sized washer and dryer (no spacesaver stacked combo so common in cabins). Andrew was reachable and attentive, which was very nice! The dog bowls were an added bonus for our fur babies. The cabin was awesome but we want to come back when we can get full use of the back porch. My mom loved shopping in town, the men loved tending the fire and the kids loved all of it. My dog especially liked being there and getting to explore the creek and surroundings. Thank you for sharing. So glad everyone enjoyed themselves. Look forward to having you back this summer. The peacefulness of the sounds and sights of the mountain stream was absolutely refreshing. What a terrific weekend. Glad to have you back again. We spent a weekend at the cabin with our 3 children. It was truly the perfect spot for a weekend away! The cabin has two living areas, perfect for 2 couples or, in our case, 1 living area for adults, 1 for kids. It's tucked away in the woods with no neighboring houses visible from the cabin and just the sound of the water to keep you company. Lots of outdoor living space - comfortable porches, screened and unscreened. Quick drive to Highlands downtown or to hiking trails. We loved it! Bring a flashlight if you arrive after dark! We use the cabin much in the same way. Thanks so much. LOVED THIS CABIN AND CREEK!! AWESOME!! Couldn't ask for anything more.... we had to cut our stay short due to hurricane Florence as we had to get home to prepare our home for the storm. We look forward to come g back one day to try for another creekside vacation. I hope you had a safe trip home and everything is okay. Great location! This charming cabin was perfect for our vacation. We had plenty of space for our whole family. Andrew has just about thought of everything you will need for a comfortable stay. Loved sitting on the screened in back porch and listening to the creek. Highlands was very lovely town and has a lot to do and see close by. The only concern I had was the road to the cabin. It is very narrow and not paved. Our daughters FWD SUV had a little trouble getting out after some rain. 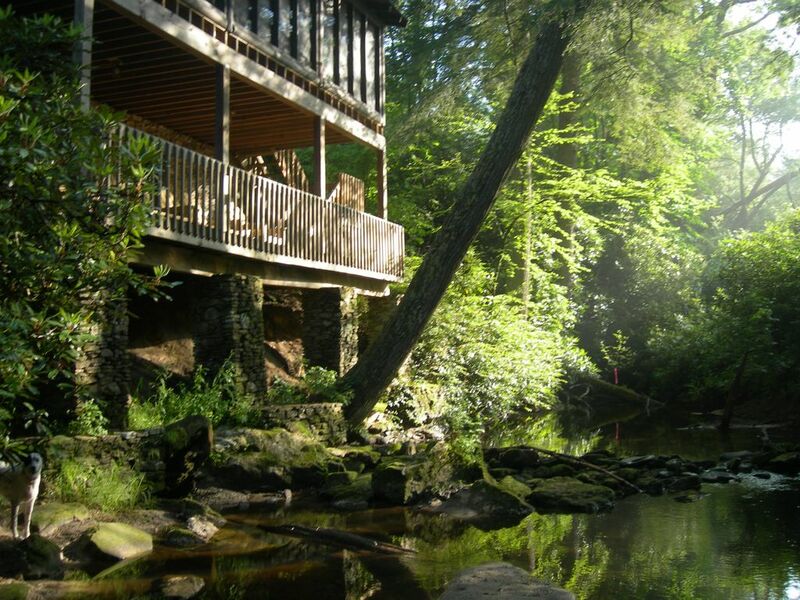 Just 10 minutes from downtown Highlands our cabin is located in a secluded area on a large creek. The new addition features a large living room area with wood-burning stove, sleeping area, loft, full bath and A/C. The Highlands/Cashiers area is rich with spectacular hikes and is the place to go to enjoy nature without mosquitoes, searing heat and humidity. Waterfalls, rivers, creeks and lakes abound. Besides hiking, activities include fly fishing, high-end shopping, gourmet dining and golfing. Family activities include llama treks, gem mining, wading in our creek, lake swimming and fishing. $200 refundable deposit required for dogs.